During the summer months, many Ohio lawns take a lot of stress whether its from the crazy weather or kids playing outside. Your lawn may have bare spots that are in need of reseeding. The good news is that the end of summer and start of fall is a perfect time to reseed your lawn. If you aren’t sure how to go about this, we have tips for you! Before you can begin overseeding your lawn, you’ll need to know what type of grass seed you want to use. Know the type of grass that grows best in your area, whether it’s a warm-season grass or cool-season grass. You should also take into consideration how much sunlight a specific type of grass will need to grow, and if it can still thrive in shade. Check out a great breakdown of the different types of grasses and what each needs to successfully grow here. 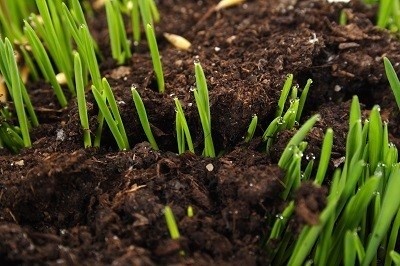 Late summer and early fall is prime time for reseeding your lawn. Make sure you don’t wait too long into fall to begin the process though. You’ll want to give the seed enough time to take root and grow before winter comes in. Another great thing to do for your lawn in the early fall is to aerate it. An aeration consists of creating thousands of tiny holes in your lawn to relieve compaction of the soil and allow water and other key nutrients to better get to the roots. These newly created holes in your lawn are also great for allowing seed to get deep into the soil and take root. So before you reseed your lawn, you may want to also aerate it! You can read more about the benefits of aerating your lawn here. Once you have the seed you need and have aerated your lawn, you’ll want to even distribute the seed over your entire lawn, or in the areas where it’s needed. After seeding, make sure you water and fertilize as recommended. Check out these 8 essential tips on how to make sure that your lawn is effectively overseeded. Looking for more DIY lawn care tips? Download our FREE DIY Guide! It has more tips on how you can maintain your lawn and keep it healthy. Just click below to get your guide today!